Binghamton NY rapper Tone Chop and Winnipeg based producer Tone Chop release their debut collaboration EP “Veteran” on November 18th through Seven 13 Music & Entertainment. Available to pre-order on ITUNES, the 7 tracks are the product of two artists who began as rap battle rivals in upstate NY before becoming partners in rhyme and tagging. Frost’s subsequent move to Canada saw the pair pursue solo careers, Chop releasing a whole series of mixtapes including collaborations with Tom Gist, St Laz and Jinx Da Juvy. Now fully focused on beatmaking, Frost’s earlier productions saw him work with Sadat-X, Rakim’s son Tahmell and J-Ro. Earlier this year he contributed to Seven 13’s “God Bless Dope Rappers” compilation which also featured Royce da 5’9″, Horseshoe Gang, Kid Vishis and Crooked I.
NY State rapper & producer duo Tone Chop and Frost Gamble release their new EP on November 18th through Seven 13 Music & Entertainment. “Veteran” is appropriately named as the pair were originally rap battle rivals in the 90’s before developing a partnership in tagging and rhyming. Having subsequently moved to Canada, Frost continued to contribute to Chop’s various projects though both pursue solo careers that have seen them work with J-Ro, Tom Gist, Sadat-X, Tahmell and Jinx Da Juvy. The new release represents their first official collaboration together and is a little early taster of what’s to come in 2017. New York State rapper & producer duo, Tone Chop & Frost Gamble, release their new EP “Veteran” on November 18th through Seven 13 Music & Entertainment. The collaboration is born of a rap battle rivalry dating back to the 90’s, but the pair have re-united with Frost now relocated to Canada and focused solely on beatmaking. Among his production credits there is work with Sadat-X, J-Ro, Rakim’s son Tahmell, and contributions to this year’s “God Bless Dope Rappers” compilation featuring Royce da 5’9″, Crooked I, Horsehose Gang and many more. 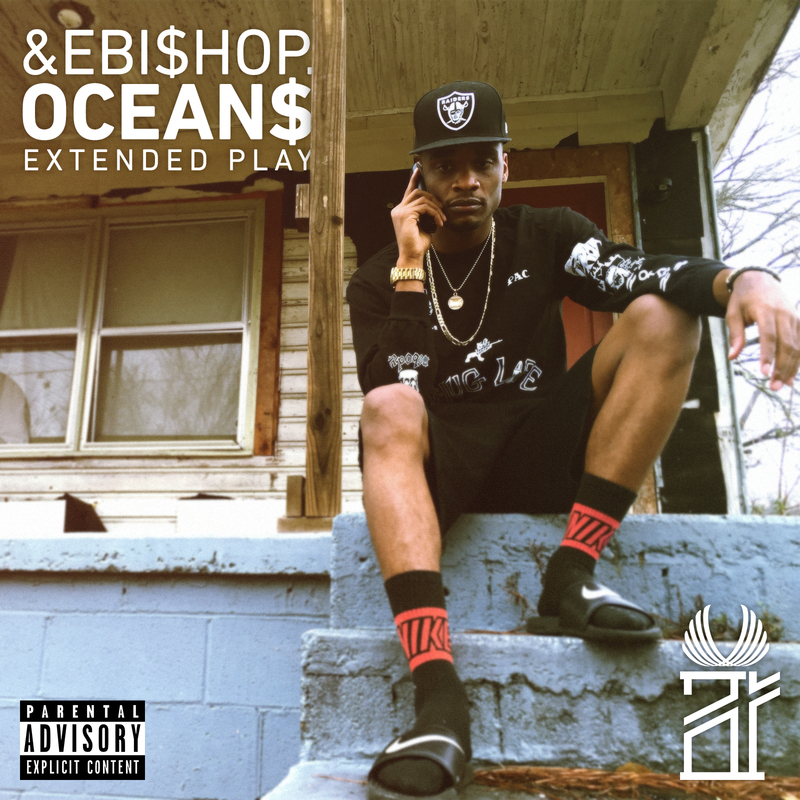 Southern rapper & producer Ande Bishop releases his debut EP, entitled “Ocean$ – Extended Play” on 19th May. The most recent signing to the ever expanding Seven 13 Entertainment, he’s being tipped by many as one of the hottest talents to emerge from the Atlanta area, due to his fresh sound and approach which is down in no small way to the variety of influences he grew up with. On the production front he started by mixing classic soul and r&b with some Southern flavours, and growing up listening to classic hip hop artists Tupac and Blu with those closer to home such as T.I. has developed a style which is already drawing some early comparisons to Outkast and Isaiah Rashad. 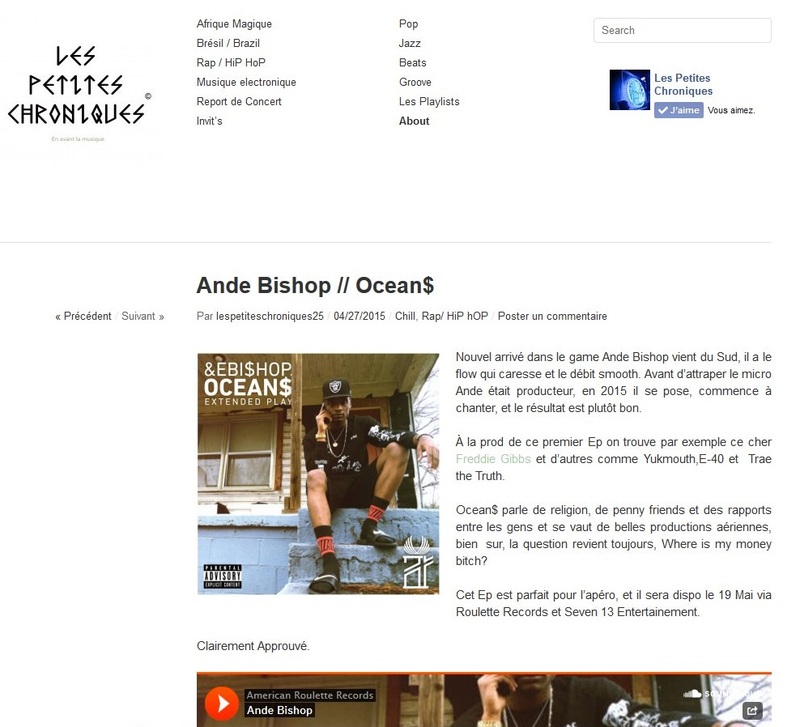 French online “Les Petites Chroniques”, translated as “the little reviews” produce a series of snapshot summaries of various releases, and have just published this one for Ande’s new EP. The summary “Cet EP est parfiat pour l’apero” reflects that the EP is perfect for the “Apero” tradition of a few summer drinks in the early evening due to it’s overall chilled sound. The latest emerging name in the new wave of Southern Rap artists, Ande Bishop’s approach is diverse thanks to his varying influences over the years including Tupac, Blu & Exile, Lil Wayne, Erykah Badu and T.I. A recent newcomer to the production game, he started experimenting with beats by mashing classic r&b and soul samples with Southern kicks before swapping the desk for the mic. 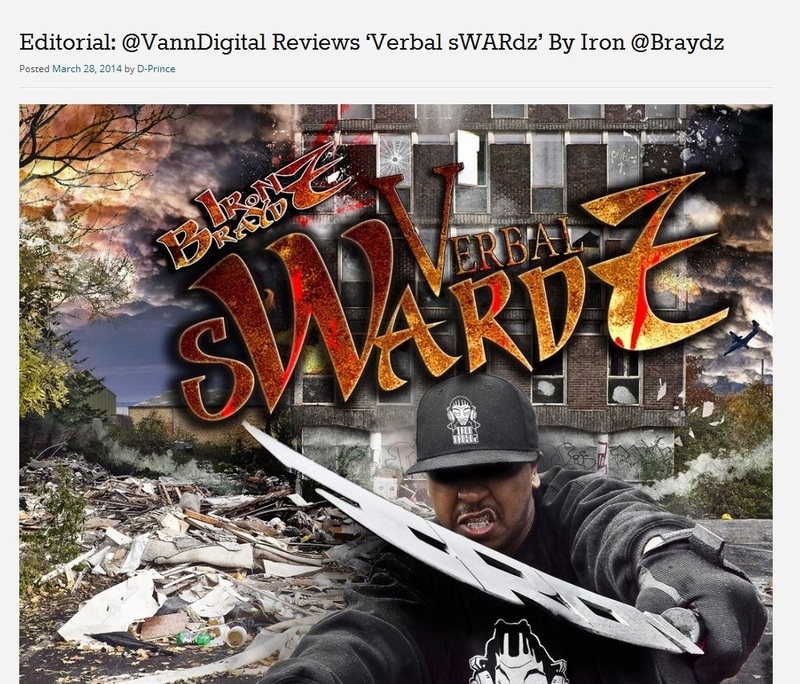 With just over 2 weeks to go until the release of London Emcee & producer Iron Braydz’ EP “Verbal sWARdz”, US online Vann Digital are the latest to publish a review. Look out for more media coverage on this release in the next few weeks from the UK, Europe, USA, Canada and further afield. Been a real appreciation for the lyrical skillz and production on this one around the world.